You haven’t spent much time wondering if something else is the problem, have you? Did it ever cross your mind that you’re sitting in the back of a cop car because you eat too much pizza, or work out too often, or watch more TV than you should? The point I’m driving at is that once you get any kind of nagging feeling that something’s up with your drinking, it almost always is. The simple truth is that alcohol screws more lives up than you could ever imagine. I see it every single day. If you could do my job for any length of time, you would have a front row seat to watch people going out and getting in trouble again and again, all because of drinking. It’s often said that “the definition of insanity is doing the same thing over and over again, and expecting a different result.” When it comes to racking up DUI’s or other criminal charges after drinking, people frequently live in a state of denial, while everyone around them sees their use of alcohol as the real problem. Whatever else, there has probably NEVER been an occasion, in the history of the world, where someone has had that sinking feeling that their drinking has become a problem and been wrong about it. So how do we deal with this? To be clear, lots of people get a single DUI and don’t have a drinking problem. The truth is that most of us have probably driven while over the limit at some point (or points) in our lives without getting caught. To be sure, getting caught is often just a matter of bad luck. Yet we must also remember that every 2nd and 3rd offense DUI driver started out with a 1st offense. Numerous studies have consistently validated that, as a group, people busted for OWI have a significantly higher incidence of alcohol problems than the population at large. In other words, people caught driving drunk just one time are part of an “at risk” group, while it is a foregone conclusion that those caught a second or third time do have a drinking problem. I want to circle back to what you think, though. If you’re reading this because you’re in hot water for something that is related to alcohol in any way, are you scrambling to explain how your drinking isn’t as bad as it looks? One of the most self-defeating tactics that most of us employ at some time or another is to compare ourselves to someone who is “worse” than we are. If Tina is overweight and eats too much junk food, she’ll point to Jenny, who eats way more. If Tim is confronted about smoking, he’ll say he’s not as bad as Mike, who goes through a whole pack of cigarettes a day. It’s human nature to do this, but is also fails to address the real issue; has something become a problem for you? I cannot count how many times, in the context of a real heart-to-heart conversation with a DUI client, I’ve had a person just “fold” and admit that they know something is wrong with their drinking. It is a prerequisite to fixing something that one first admits it’s broken. That said, not everyone has to have some kind of profound, “Come to Jesus” moment. Sometimes, good things happen when a person just cracks the door a little bit and lets in some light, rather than slamming it shut against any notion that his or her relationship to alcohol may have become problematic. In other words, you don’t have to dive into all this stuff headfirst; instead, you simply have to allow yourself to be open to the idea, that, yes, your drinking is making your life difficult. For most people, however, there is some kind of “lightbulb” moment, often described as “hitting bottom,” when they realize that drinking is a problem, and that fixing it means quitting. Statistically, most people who have a drinking problem will never get over it. As sad as that may be, this article isn’t really for them. What is universal among those who do “get it” is that absolutely every last person who does quit drinking looks back and wishes they would have done it sooner. In hindsight, they easily recognize some the signs that seem so clear now, but meant nothing before. What’s also universally true is that you won’t stop until you’re ready. However, sometimes, a person can hear or read one little thing that may change their thinking and affect how they process things in order to tip the balance, at some point down the road, in favor of not drinking anymore. Although pure logic tends to go out the window when dealing with addiction issues, one cannot really argue against the idea that anything that causes a problem is a problem. 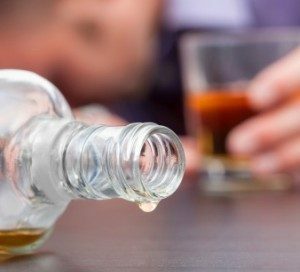 Those drinkers in the thick of denial will point to everything under the sun (except alcohol) as the “cause” of their difficulties, and sometimes have to put in a hell of a lot of effort to overlook or rationalize away the role that drinking has played in creating the situations that have caused them so much grief. If you’ve been arrested for a DUI, you may or may not be ready to look at your drinking. Even though DUI drivers have a statistically higher rate of drinking problems than the larger population, the fact also remains that most 1st offenders don’t have a drinking problem. If your DUI just “happened,” then it probably isn’t symptomatic of any larger problem. However, if your DUI is yet another in a line of problems or setbacks in your life, then it may mean there’s something more to it. It’s the same thing if you’re facing a DUI and you have, to any extent, been thinking or wondering about your drinking. Another misconception that holds people back from recognizing that they’re relationship to alcohol has become troublesome is the idea that “problem” drinking has to be frequent, or severe. If Social Sam only drinks a few times a year, and almost never has any issues, except that, once in a while, he overdoes it and then winds up in some kind of messy situation, his drinking is a problem, if for no other reason than it is a risk for him however infrequently he imbibes. You don’t have to be old, or some last-gasp alcoholic with the shakes for your drinking to be problematic. And to be clear, the very moment you ever think about “controlling” or otherwise trying to manage your drinking, it has become a problem. There is a lot to this, but the bottom line is that normal drinkers never have to think this way. This means that you don’t have to drink every day, or even very often, in order for your relationship to alcohol to be troublesome. If Tina and Tom were married for many years, then divorced because during the last few years together, all they did was fight, and now they live in different states, but every time they’re put in the same room they start to go at each other, their relationship is still considered toxic. They don’t need to remarry to be bad for each other. Also, just because you drink way less than someone else doesn’t mean anything. In fact, just because someone else gets in more trouble doesn’t mean anything, either. If Fat Tony is tipping the scales at 360 pounds, does it really matter if he knows a guy who weighs 390? Some of my most profound experiences as a lawyer have come during those heart-to-heart talks with my clients. I’m damn good in the courtroom, but I’m just as good in the conference room, as well. There are no hard and fast rule about how to interact with people, other than to be honest and decent. Everyone is different. There are people need me to stand firm; others need me to listen as they vent, and some prefer a non-judgmental back-and-forth, easygoing conversation. This is where that “counselor” part of the title “attorney and counselor at law” means something. One of the more interesting skills I learned when I did my post-graduate work in addiction studies was the concept of “reflective listening,” where you mirror back what a person is saying so that they can see the gaps in their reasoning, or by contrast to help reinforce their better insights. When a person is facing a DUI or criminal charge that involves drinking, you can learn a lot both from what they say, and what they don’t. When someone is facing a 2nd or 3rd DUI, for example, and they want to spend all their time complaining about how unfair things are, it’s likely they don’t see their drinking as any kind of real problem. What’s more, yelling at them, or otherwise trying to “force” them to understand is a waste of time. This is why that “a-ha moment” is so special; it comes on its own. Sure, we can give people information that might rattle around in their head and help them arrive at the realization that their drinking is a problem, but it is humanly impossible to to make it happen before they reach it on their own. So what’s the big takeaway here? That coming to grips with the idea that your drinking is problem is a gift, really, that most people won’t ever get. If you’ve ever wondered if something might be off with your relationship to alcohol, then there probably is. Deep inside all of us, in our heart of hearts, we get these “feeling” that indicate something isn’t right here, but we become real good at ignoring them. If you’re in legal trouble and drinking played any part in the reason(s) for that, then it’s time to start taking an honest look at things. If your criminal or DUI matter is anywhere in Oakland, Macomb or Wayne County and you’re looking for skillful legal representation, give me a ring. In terms of all the courtroom legal stuff, my team and I are unsurpassed. When it comes to analyzing and discussing your drinking, my background and specialized education makes me uniquely able to offer everything from advice and clinical direction to just a good set of ears. If you’re looking for a lawyer, be a good consumer and do your homework. Read around. Then, call around. You can reach my office Monday through Friday, from 8:30 a.m. until 5:00 p.m., at 586-465-1980. We’re here to help.